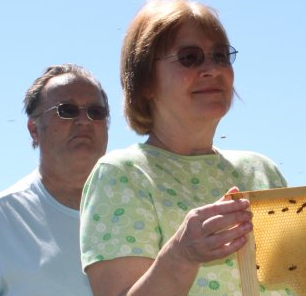 The Beekeepers Association of the Ozarks is a non-profit organized November 11, 1974, and was formed to engage in activities promoting the common interest of beekeeping and the general welfare of the honey bee. Currently we have over 200 members that cover Greene and the surrounding counties. Our main goal is to provide information, education, and service to the area. Some of the functions we offer are basic beekeeping courses which is designed to get a person started in beekeeping. We attend the local fairs and farming functions and provide a place where the general public can ask questions and get information. Our members often volunteer in the public schools to do presentations for our children. We also provide swarm removal of honey bees to the public usually at no charge. Lastly we promote and sell honey to the public and along with other hive products like beeswax, candles and many other items made from the hive. We meet the 4th Tuesday of every month. We start Q&A at 6:00 pm with the meeting to follow. Other events are announced at meetings and on the website. We meet on the 4th Tuesday of every month. Q&A starts at 6:00 PM, with the meeting to follow. It's that time of the year folks, Swarm Season. You might start hearing about or seeing pictures of bee swarms on social media. There is even a chance you could encounter one yourself! The first thing we recommend is DON'T PANIC! Bees that are swarming typically have more important things to worry about than you, and as long as they are not threatened will not retaliate. Contact anyone you know who is experienced with safely removing bees that will ensure they have a good home to move to. DO NOT CALL AN EXTERMINATOR!